The SHANNON MUIR’S INFINITE HOUSE OF BOOKS column on Mondays and Wednesdays is a place at Shannon Muir’s author website showcasing books from a variety of fiction genres, with an emphasis on interviews and guest posts from other authors. One thing Shannon firmly believes in for readers not only to learn about new books available, but about those who craft the tales behind them. As its name implies, SHANNON MUIR’S INFINITE HOUSE OF BOOKS weekly column features writers from all genres of fiction who want their potential audience to get to know them, and their works, better. 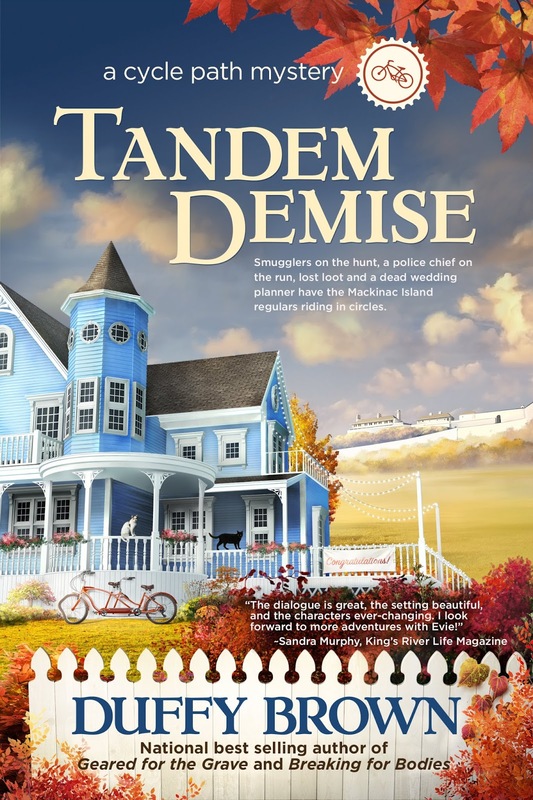 Today, we look at TANDEM DEMISE. Smugglers on the hunt, a police chief on the run, lost loot and a dead wedding planner have the Mackinac Island regulars riding in circles. After solving two murders, bike shop owner Evie Bloomfield thought life on Mackinac Island would settle into boredom until she finds out Nate Sutter, island police chief and once-upon-a-time under cover cop is on the run. Some badass guys from Nate’s Detroit days think he stole money from them in a champagne smuggling operation and now they’re headed to the island to get their loot. Evie is determined to help Nate because he’s a good cop. Nate is determined to keep interfering Evie and island locals out of harms way, and the crooks are determined to get their money. “Surprise, surprise. No bars,” Fiona said looking over my shoulder. I pocketed the phone I used for playing Candy Crush and [SH1] making selfies. The foghorn moaned again, mixing with the deep rumble of a passing freighter somewhere out there in the pea soup. Today I’m very lucky to be interviewing Duffy Brown author of Tandem Demise. Hi Duffy, thank you for agreeing to this interview. For those readers not familiar with you, would you please tell us a bit about yourself? I live in Cincinnati with two cats, Dr. Watson and Spooky. I may pay the bills around here but they rule the roost. 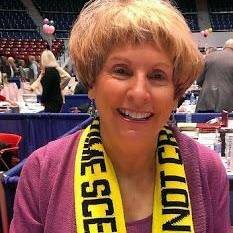 I write cozy mysteries and have two series, Cycle Path Mysteries set on Mackinac Island and the Consignment Shop Mysteries set in Savannah. So what are cozy mysteries? They are mysteries without the blood, guts, and gore and my books are humorous. How can murder be humorous? Kill off the people who have it coming. LOL. I love Savannah and Mackinac Island and that’s why I set my books there. Perfect places to visit and maybe stumble across a body or two. Do you have any New Year resolutions? What are they? Every year it’s the same thing so that gives you an idea how successful I am. I want to lose weight and exercise more. And I’d really like to give up junk food…yeah, like that’s going to happen. Does writing energize or exhaust you? Both. I love telling a good story and making readers laugh. Life is filled with angst so I like to concentrate on the funny side. Sometimes I think that’s how we get through the tough times. When I write a funny scene that really makes my day as I know the readers will have fun with it too. Writing is exhausting in that it’s work. Humor is really hard. Everyone cries at the same thing but finding something that’s truly funny is tough business. Tell us about your favorite writing environment. Indoors, outdoors, a special room, etc.? I write at my desk. It’s the only place I can write. I need quiet and I need to concentrate on what I’m doing. I write on a computer but I plot on a big sheet of paper where I draw out the chapters and figure out whodunit it and who are the suspects. I love the feel of paper and pencil. Somehow it feels more creative than just tying on a computer. If you could have dinner with any three authors (alive or dead, who would you choose and why? How about characters! I love Sherlock Holmes! Love how clever he is and smart and how he puts it all together. And then there’s Nancy Drew. I love Nancy. I’m sure one of the reasons I write mystery is Nancy Drew. And she was so successful and doing adventuresome things back in the day when only guys did those things. She had the neat roadster, the neat clothes and did all the sleuthing. I wanted to be Nancy and now I’d like to thank her for showing me that a woman’s place was not only in the home but wherever life took her. Thank you Nancy Drew. As for an author, I’d love to have lunch with Agatha Christie. Another woman who had the guts to follow her dream in a man’s world. What a great inspiration. I’d like to know who inspired her to write mysteries. Tandem Demise…… Tell us about the book with this fun little challenge using the title of the book T is for …. Tourists! There are only 500 people who life on Mackinac all year long and there are over a million tourists! You never know who is going to show up. You can only get to the island by boat. A is for … adventure on Mackinac Island. Getting to know Mackinac and the people who live there and the tourists who visit is such fun. N is for … Nate Sutter…the chief of police on Mackinac Island accused of murder in Tandem Demise. D is for … Dead guy on the dock…how the book opens. The dead guy has a bottle of champagne clutched in his hands. How does this play into the mystery. E is for … Evie Bloomfield the main character. She owns a bicycle rental shop on Mackinac Island. Evie is from Chicago, the land of malls, cars and noise. Coming to the island is a total change. M is for … Mackinac Island, an eight mile chunk of land where Lake Huron meets Lake Michigan. There are no cars on Mackinac and the only form of transportation is big horses, a ton of bikes and a lot of tourists on foot. Please share the opening lines of this book: “Do you think he’s dead or just dead drunk?” I asked Fiona as the two of us stood alone on the Mackinac Island freight dock with thick night fog swirling around us. We were staring at a guy prone on the pier with a Champagne bottle clutched in his arms. Please share a few Fun facts about this book: There are two cats, Bambino and Cleveland. They are very judgmental cats. Evie owns a bike shop and she can’t ride a bike. The only place cell phones work on the island is if you’re hanging off the pier. The Detroit mob has a house on the island for their retired gangsters. There are 18 fudge shops on the island. Without revealing too much, what is your favorite scene in the book? “Do you think he’s dead or just dead drunk?” I asked Fiona as the two of us stood alone on the freight dock with thick night fog swirling around us. We were staring at a guy prone on the pier with a Champagne bottle clutched in his arms. Shivering as much from the breeze off Lake Huron as our situation I grabbed Fiona’s hand as we shuffled a little closer. “He’s staring back at us and not in a Hey come have a drink with me kind of way.” “And there’s blood, a lot of it. How doses this keep happening to you?” Fiona wanted to know. “Mackinac’s a little island but guess what, you come across yet another body!” “Hold on a minute, stop right there. Forget the youpart about the bodies. Okay, the first one was mine I’ll give you that, but the last one was definitely a webody. Readers should read this book… If you want mystery and you want to laugh. If you don’t laugh I’ll buy the book back. 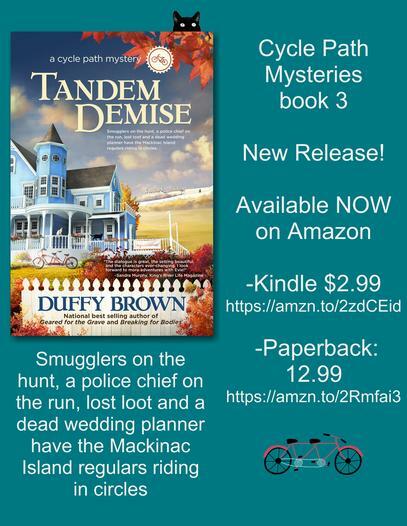 Tandem Demise is an escape to Mackinac Island for a mystery, a visit with fun characters and some laughs along the way. Thank you very much for taking the time out of your busy schedule to take part in this interview.